So I was talking to my friend Stevie John, and he was lamenting the fact that over the last three years since he has been working at a desk job, he has packed on 40 pounds. When he started he was 180lbs and today he is 220. As you know, I started on this program at 250lb and as of today, after 176 days, yea I am counting the days, helps to keep me on track, I am at 180lbs. I am quite satisfied with that. Me and Steven were talking about that and decided that we will support and encourage each other with one month goals. The goal for me this month is to get to 60 pushups consecutively on my max rep day and 300 pushups on my 5 set days, as well as to include pull ups at least once a week in my regimen. I was thinking maybe the pushup days would be good to add the pullups, so that would bring it to three times a week. What do you think?! I do not have any further weight loss or waist loss goal, just a desire to keep improving and have a lower body fat percentage. Honestly, I do not know what it is right now. I am satisfied with how clothes are fitting now and do not think I should go any slimmer, I think it is enough, Zehhu! He made a goal for himself of ten pounds. Ten pounds sounds reasonable, about 2.5lbs a week. SJ also said that he will post his progress here so we can all cheer him on, who knows, perhaps he will let me post his photo as well! All in favor say Aye! We did not totally agree on how we are going to go forward food wise. He still loves his pizza and that is okay. Daily cardio between 30 and 60minutes and probably more importantly to not get too hungry. He has a proclivity for Pizza, simply craves Pizza too much of the time he says. So the way to deal with that is to eat some nutritious food every 2 to 3 hours and keep the quantity moderate, enough to quell the hunger. That is his solution for himself, which works for me, any effort is better than no effort! Kidney beans and veggie burger – probably the beans there were the most nutritious. Strawberries and Blueberries for a snack. Trader Joe Whole Wheat tuscan bread ( 2 slices ), spinach, tomato, onion, a few slices of applegate roasted turkey breast and some light mayo. – The salad here was probably the most nutritious, the turkey and bread seemed pretty good too, for Steve that is, not for moi, no bread for me, no thanks! Another 2 slices of the same bread, peanut butter, strawberries and a hard boiled egg. About 10pm he will do more cardio and hopefully get back to us this week on what has happened over the week, the type of food, the exercise and the results! As for me today, I was just hungry in the morning, so I had a hashi mashi (shocking!) from Cafe Tudor and Chefs Yassin & Zaza led the way again in making a great Hashi Mashi. 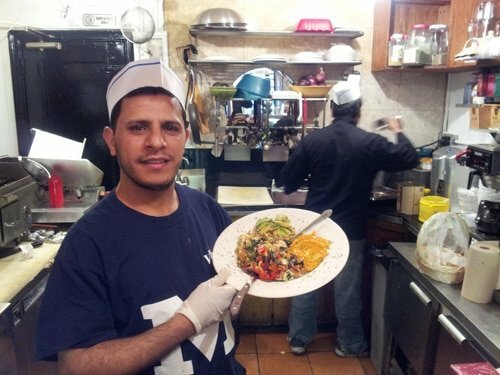 Chef Zaza was so enthusiastic today that he asked me to take the photo of him serving his great Hashi Mashi. And that is how we got our latest picture of Chef Zaza!